This year it was more glorious than usual (sorry, grouse). I no longer covet a Kindle. Two years ago I really, really, seriously coveted a Kindle. Mon mari outdid himself this year….. I am now the proud owner of a Kindle and spent most of my birthday downloading free books and playing with my new toy. I had no idea it could do so much. My garden is becoming more and more like a jungle. 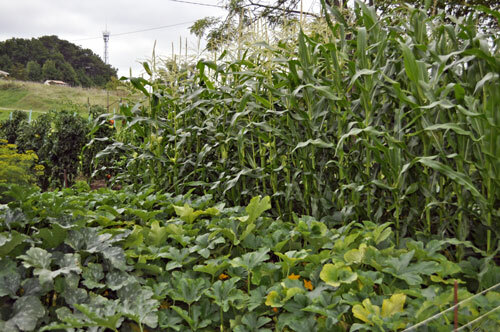 The corn is over 8′ tall and the squashes are taking over everything. I cut them back everyday and they just keep spreading. I spend half my day picking vegetables and the other half dealing with them. Dealing with the vegetables includes cooking, freezing, eating and tossing into the compost pile…. not necessarily in that order. I will confess that, even though in past years I have frozen vegetables, I have never eaten them. I freeze them because I can’t abide waste. I don’t eat them because by the time winter comes around I’m thoroughly tired of summer vegetables and want nothing but winter crucifers. But I still can’t abide waste. Mon mari likes a cup of soup with his lunch on cold days in winter. I also can’t abide the commercial ‘cup of soup’ packets that pass for food. Making simple vegetable soups for the freezer is easy. I make them rather thick and intensely flavored – to conserve freezer space. To use, I thaw a container (usually on top of the wood stove) and add either water or chicken stock. One container gives mon mari a ‘cup’ of soup for three days. Or me a full bowl for lunch. 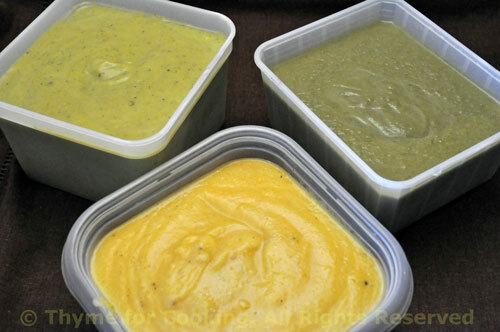 Zucchini (Courgette) Soup, Green Bean Soup and Yellow Tomato Soup. Roughly chop all vegetables. Sauté onion in olive oil for 5 minutes. Add pepper, carrot, garlic, 3 cups chicken stock, cover and bring to a boil. Reduce heat, add rice and simmer 30 minutes. Puree soup, adding as much additional chicken stock as needed or desired. I cannot abide food waste either – I freeze too and I believe it is a money saving system especially if the produce is home grown. Grow, freeze and eat the following season is my mantra !! Happy Birthday Katie! I love making soups of all kinds – and using frozen summer veggies is the perfect way! How many free books do you get with a Kindle….does that include cook books too….maybe I want one now! Happy Birthday and Happy Glorious Twelfth. Twelfth strikes me as a really funny word, now that I try to type it. Talk about a tongue-twister! Makes me feel bad for people who are trying to learn English. Happy birthday! And thank you for the great freezing advice and recipe. Your garden appears ravenously healthy – Good luck with all of the labor keeping it at bay! manningroad, I have a freezer just for vegetables, and it’s packed to bursting at the moment… time to quit. Ina, thank you – there are over a million available I haven’t checked to thoroughly yet…. the Kindle will hold around 3400 at a time. Zoomie… thanks. I have had fun with other words with people learning English…. Charlotte, shameless self-promotion accepted…. Congrats and thanks for the tip. Viviane, Thanks…My garden is going crazy and my freezer is full….